As Mark Lanegan of the Screaming Trees wailed in his brooding baritone in the Seattle band’s early ’90s, alternative-rock quasi-hit, “Nearly Lost You,” it’s unlikely that he knew he was crooning a phrase that could serve as the hope-filled motto for the majority of his career. Every time the singer seemed poised to break through, widespread recognition slipped through his fingers. Still, Lanegan has kept chasing the dream. In the song, Lanegan growls about an allusive, hellish nightmare that keeps calling him back and that too could serve as a metaphor for his years spent toiling in musical obscurity while other, lesser acts graduated to the big time during the alternative music explosion. More than 15 years after his closest sideswipe with fame, Lanegan seems primed to reiterate the song’s point with a new band — founded with fellow ’90s couldabeen, Greg Dulli of the Afghan Whigs — and a new album, “Saturnalia.” This time, the pair is hoping their combined efforts will allow them to finally grab that brass ring. When looking back at the ’90s alternative music upsurge, the aftereffects appear surprisingly ephemeral from today’s perspective, but perhaps history hasn’t yet had its final say on the matter. If we’re to do some guesswork about that era’s legacy, we should look from the vantage point of those who missed out — the Generation Y whippersnappers and other youngsters — who are wondering what all of the flannel and Lollapalooza hubbub was about. Will it be Kurt Cobain on a T-shirt? Or will it be the sight of a bunch of fading stars forming jock-rock bands like Velvet Revolver and Audioslave? Lanegan and Dulli’s project, called the Gutter Twins, corrects a course gone wrong and suggests that not all survivors from the grunge years have surrendered to popular tastes. The former frontmen are a pair of Tom Waits and Leonard Cohen worshipers if ever there were any. With such first-class songsmiths and musical eccentrics as stylistic beacons, the duet’s darkly romantic and character-rich debut is a testament that not all supposed all-star projects are doomed to come crashing to earth. In fact, this pair of ’90s ne’er-do-wells might have finally found an ideal vehicle for their talents. 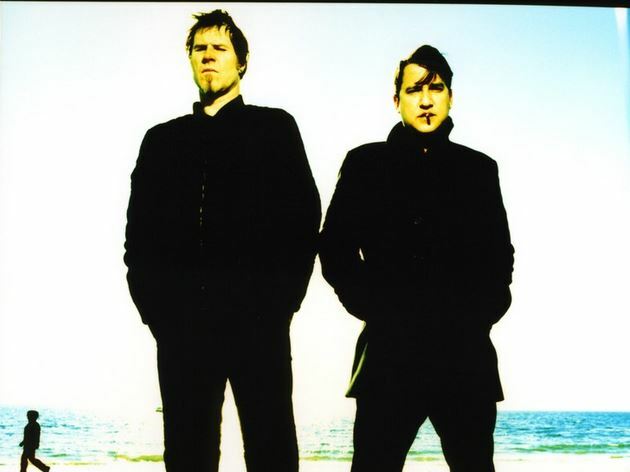 The duo has kept steadily busy since they both missed their big chances at conquering the world beyond Spin magazine and MTV’s “120 Minutes.” Lanegan has drifted in and out of the Queens of the Stone Age’s orbit, offering his grit-torn vocals to a couple songs per disc and onstage, and even recorded an overlooked solo album. Dulli has primarily occupied himself with his solo project, the Twilight Singers, although he did manage a brief Whigs reunion last year for a greatest hits disc. “Saturnalia” is the culmination of their history as well as the years of cross-pollinating collaborations between the two. Lanegan appeared on a couple of Twilight Singers albums and even toured with the band. Dulli returned the favor when he joined the menagerie of stars who guested on Lanegan’s last solo disc, “Bubblegum.” There’s a sense of cooperation in how their distinct voices play off each other and how they divvy space for each other’s songs. Although Lanegan is the more distinctive singer, Dulli is a superior songwriter and responsible for many of the disc’s best hooks. To be sure, Dulli’s tenor is front and center during the best moments of the record’s perspective singles, “God’s Children” and “Idle Hands.” Enveloped in a haze of an organ hissing and a recurring, four-note guitar phrase, “God’s Children” begins like a mashup of AC/DC’s “Hells Bells” and the Wailers’ “Concrete Jungle.” As the drumming kicks in and the rhythm picks up, Dulli takes the spotlight and sings like a bard whose imagination is dominated by night scenes and memories of gut-wrenching passion and pain. Dulli and Lanegan hook up for a deep-voice harmony during an ecstatic chorus as a fuzz guitar sputters out a solo. Lanegan is the dominant voice on the high-energy rocker, “Idle Hands,” but he gets some vocal assistance from Dulli during key lines and the choruses, which sweetens their sound. When Lanegan’s on his own for solo turns at the mic, he’s surprisingly inconsistent. He struggles to hold together the crumbling melody and jarring instrumentation on “All Misery/Flowers.” Later on, however, he comes across as a croak-throated master on the midtempo funky dirge of “Bete Norte.” Another unexpected facet of “Saturnalia” is how such grizzly rock vets are open to utilize electronic drum machines on a couple of tracks. “Each To Each” and “The Body” fuse the mechanical elements with plenty of guitars and the pair’s cigarette-stained vocal blend. They even mimic a drum machine on another track, “I Was In Love With You,” but it’s this song’s use of a sinister-sounding electric piano at its start that makes it appear like a holdover from a Queens of the Stone Age jam session. Instead, the pair springboard off this and fuses together late-Beatles-inspired guitarwork and funeral keyboards into a powerful and unabashed torch song. For the most part, the Twins don’t reveal their emotions so explicitly or aggressively. On an already grim-hued album, the record’s tone turns downright depressive with a trio of tracks on which Lanegan and Dulli slowly drift deeper into bleaker, gothic fantasies. With its acoustic blues swing and Biblical imagery, “Who Will Lead Us?” is the black sheep of the disc, but blends in with the other tracks because of how convincingly Lanegan wearily warbles his obsessions about being persecuted. On “Circle The Fringes,” Dulli revisits the obscured nightmare world of “Nearly Lost You,” but dives in with a slower melodic build behind him. A basic bass guitar riff forms the track’s skeleton, which is bolstered by a gloom-inducing viola and some electrical guitar bursts. As the momentum picks up, Dulli sings about dreams and love, but it’s clear that these are unattainable ideals with no tangible anchor in this reality. “It’s all right to drag the lake/And find the things you love,” he gently sings. Lanegan too feels the angst of the unattainable on “Seven Stories Underground,” where he sings in his highest register in a cut that finally lets slip its love of Tom Waits’ recent output. Lanegan plays a sinner ducking his paranoid visions and trying to make it to Heaven as a reverb-treated, country-ish guitar plucking and oddball percussions slaps and clashes in the background. That Lanegan and Dulli would form such an easy partnership on “Saturnalia” isn’t a revelation considering their past association. However, the extent of what they’ve been able to achieve together on this disc is. The album is a reward for years of hype and hopes that were dashed. The Gutter Twins do credit themselves — and to the era for which they were born from — because they followed a core tenet of the very best of the alternative rock bands: They pursued their own sound. Perhaps, this legacy, if only carried on by a few, is something history will take note of. Too many times, we nearly lost this pair amid a flood of flashier artistic lightweights. Now is the time for music fans to find them again. Sunday, March 9, Madison, Wis.
Tuesday, March 11, Newport, Ky.
Thursday, March 20, Washington, D.C.
Saturday, March 29, Boulder, Colo. Tags: "Saturnalia", Afghan Whigs, Greg Dulli, Gutter Twins, Mark Lanegan, Queens of the Stone Age, review, Screaming Trees. Bookmark the permalink.